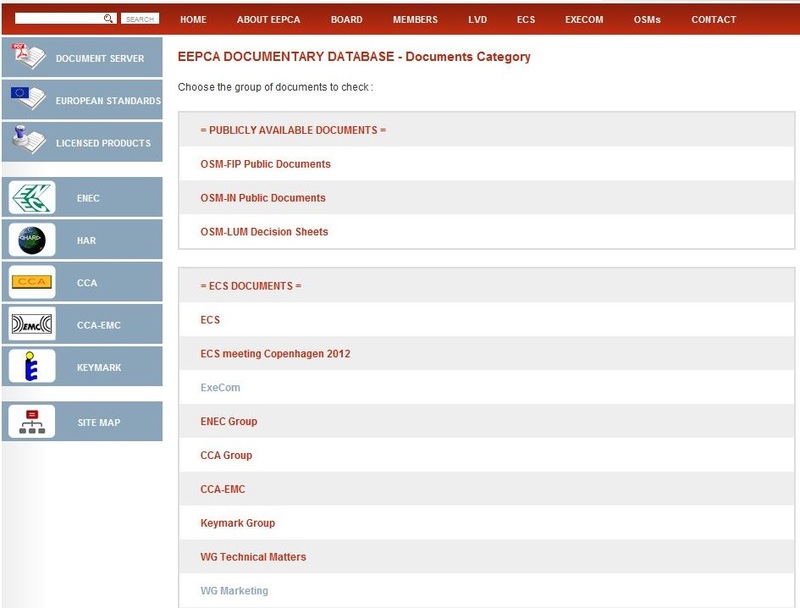 Once you have an account, you can have access to extra information on the etics.org website such as the documentary database content. In order to register now, just click on the link « create an account » on the top right of the site then fill in the form. Why do I have to choose a User ID? The User ID is your unique identifier on the website. All your rights are attached to this identifier. Why is my user ID rejected? Your User ID is your unique identifier on the etics.org website. It has to contain between 3 and 50 alphanumeric characters. Why do we need an email address? We might need to contact you in case of changes in your account or to confirm your information. We recommend that you be very careful when entering your email address in order to ensure that you’ll receive our communications. Why is my password rejected? You password must be 6 character long minimum. We recommend that you don’t use too obvious passwords such as: 123456, password, welcome, your first name or your birthdate. If you forgot your password, just click on the “forgot password” link and enter the mail address that you used to create your account. We will send an email with your information. Why can’t I receive the emails from etics.org? You mail program does not recognize etics.org as a trusted source. You have to add secretariat@eepca.eu to your list of contacts. The email you provided when setting up your account is not correct (typo, .fr instead of .com). If this is the case, just connect to your account and correct it. How to update my e-mail? Once logged in on etics.org, please click on the “account data” link and you’ll be able to edit the various information of your profile. How to connect to the website? 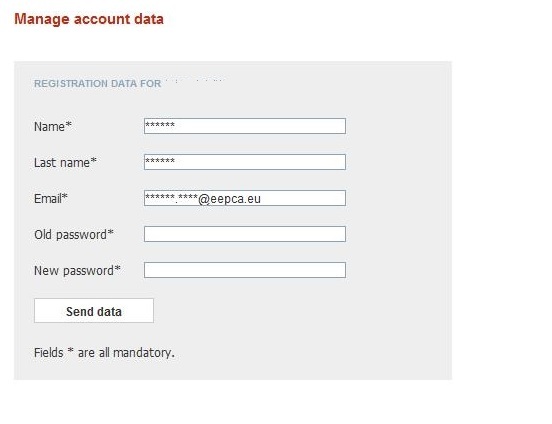 Enter your user ID and password in the appropriate box on the top right of the etics.eu website and then click on sign in. Why am I automatically connected? You are automatically connected because you have cookies on your computer. You can remove them from your browser. In this case, you will have to enter your connection information again as the website will not be able to recognize you. What can I find on the etics.org website? On the etics.org website, you can find all information related to ETICS and the schemes administrated by ETICS, namely: CCA, CCA-EMC, ENEC, KMK and HAR. What are the advantages of being signed in? When not signed in, a limited set of information is visible. The visible information is very valuable, it includes the licenses information granted by the certification bodies, and the general information on each of the schemes that is accessible on the left hand side of the window. 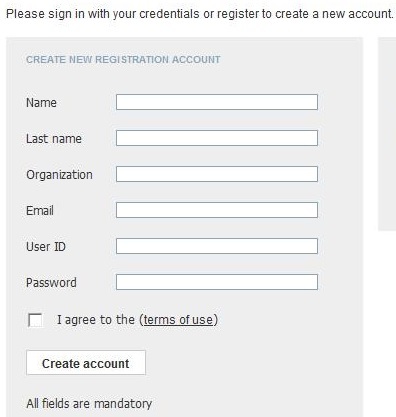 When signed in, the user has access to extra information. Depending on the rights granted in the document server content, user, when logged in, has also access to the appropriate documents and records. Why are there websites for each scheme? Each scheme website contains specific information focused on the relevant scheme. For example you will find there each scheme fact sheet or each scheme scope. How to search in the licensed products? You have different ways to search for licenses in our databases and here is how it works. The examples below are for ENEC, but the principles are the same for the other databases. 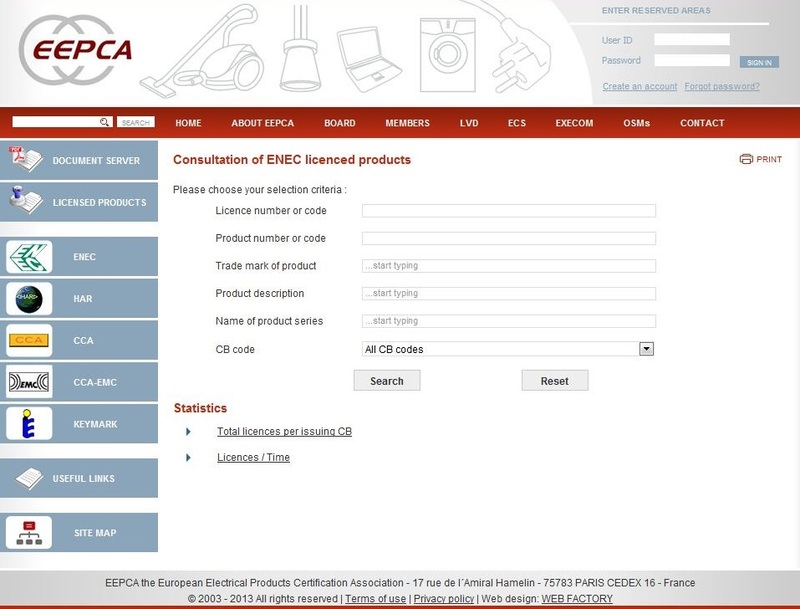 On our website, if you go to “licensed products” and choose ENEC, you will reach the page below (the direct link is to this page is: http://etics.org/recherche.php?soc=ENEC&s=1 ) where you have all the search options. By product code: If you know the product code, you can just search for it in the database. For this search to return results, you need to enter the exact product code as for this field the search engine does not take into account partial strings. By trade mark: just start typing few letters of the trade mark you are looking for and you will get suggested names. Then, just choose the one you are interested in and the corresponding licenses will be displayed. By product description: In this field, you can enter a product description (e.g. : fans) or a standard number (e.g. : part 2-80) and you’ll get all licenses for this specific product description. By name: If you know the commercial name of the product you are looking for, just enter it. As for the previous search, you will get suggestions as you are typing letters. I would not recommend this search as the corresponding field is not always properly filled in. By CB code: this allows you to see all licenses granted by one of the ENEC members. And obviously you can mix several criteria to narrow down your search.